Coming soon to a neighborhood near you. A Pushin Daisies favorite! The designs on our tshirts are original works by the artists. This a great hearse shirt. 3/4 length raglan sleeves. 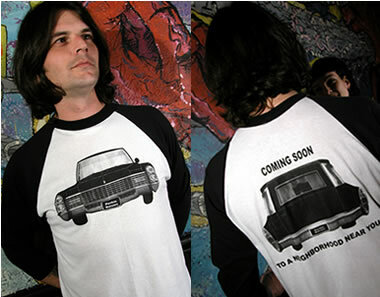 Hearse t-shirt is white with black sleeves. 50% cotton/50% polyester.